The first part is a fall detection module, which utilizes an accelerometer and gyroscope present in virtually all new phones being produced worldwide; the patient simply places the phone in their pocket. A custom made algorithm constantly monitors the phones sensors to ascertain the current state of a person about fifty times a second. As soon as a fall is detected, the phone not only sounds an on-spot alarm but also sends a message to predefined people (guardians or emergency services) with the victim’s GPS co-ordinates so help can arrive as soon as possible. The second part is an EEG module which constantly monitors the patient’s brainwave data, the EEG being used is a portable EEG device which can be connected to a phone via Bluetooth, the phone then constantly records the brain signals, the brainwave data is stored in the phone and can then later be uploaded at the press of a button to online cloud storage facilities, from where it is shared with doctors and researchers, and is of great practical importance in researching neurological disorders. 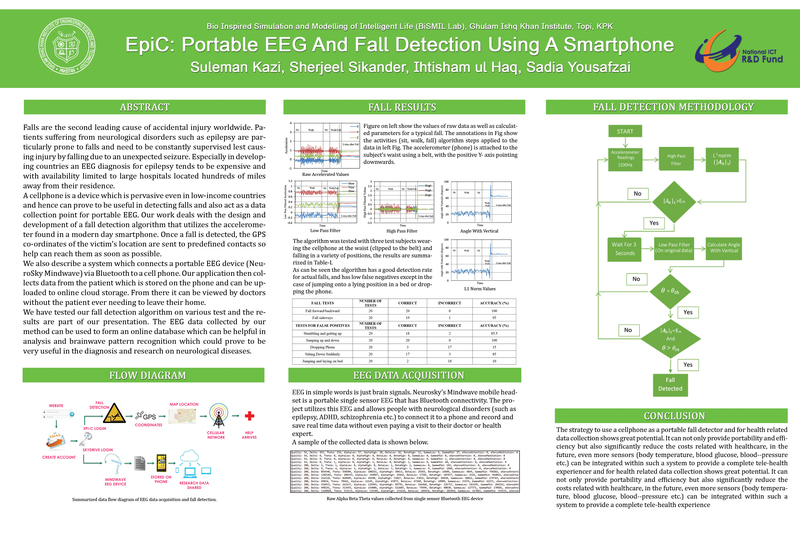 A research paper on the fall detection part was presented at the ASEE 2014 Zone 1 Conference at the University of Bridgeport, CT USA. You can download a pdf of the paper here. A poster was also presented at the 2nd Annual Computational Science Conference, 20-25th October 2013, IIUI Islamabad. You can download the poster here. Click here for additional project resources including a poster, and a software design report. National Winner of Microsoft’s Imagine Cup competition (Pakistan 2013). Represented the country at ImagineCup 2013 in St. Petersburg, Russia. Won the Institute of Engineering Technology’s “Present Around the World” competitions Pakistan Final. I was invited to Malta for the world finals.